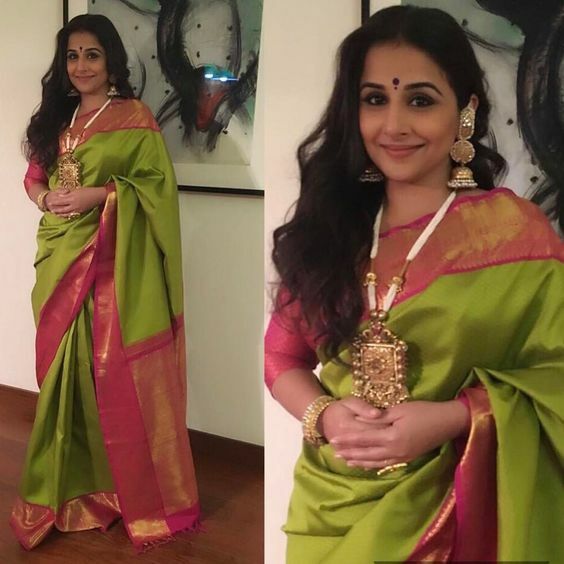 Vidya Balan has always been a Saree lover and from the day we saw her enter Bollywood till now, she has been flaunting sarees like now one else. 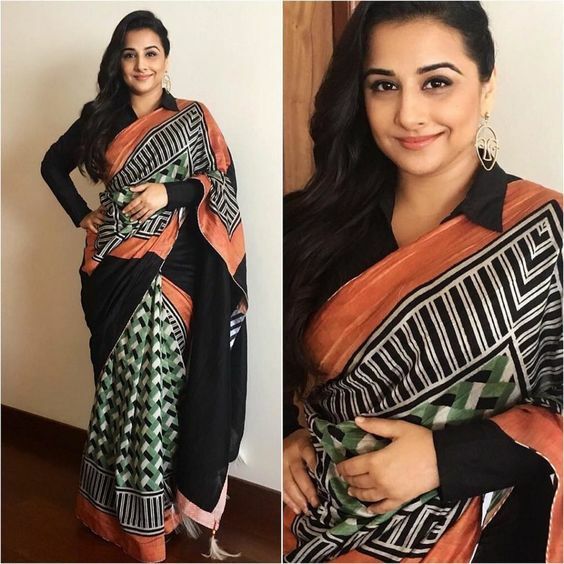 We just love how Vidya Balan styles sarees from her choice of Saree fabrics, saree patterns to styling a saree with the right saree blouse for plus size figure. 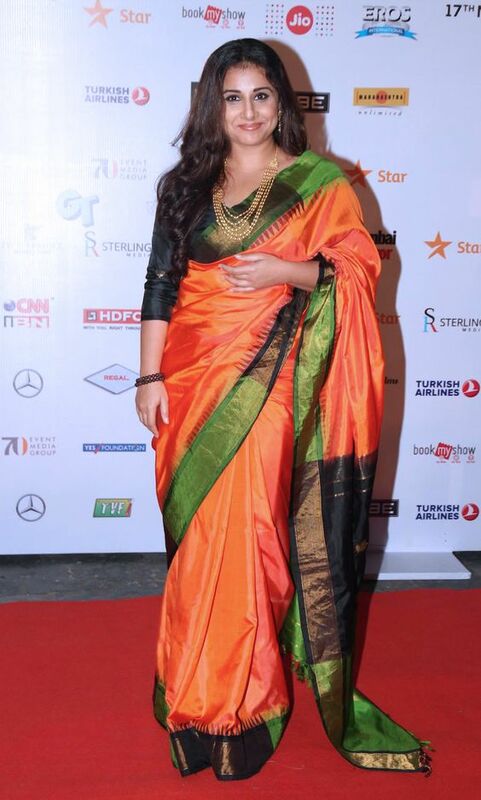 She is just a Perfect Inspiration for Plus Size women to see how to style sarees. 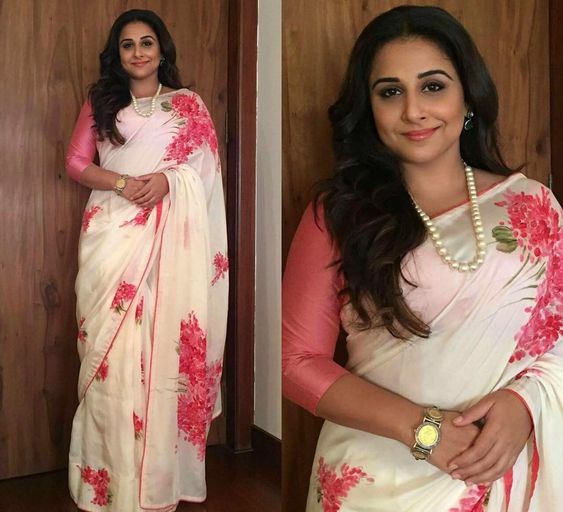 Plus Size Saree Style Inspiration by Vidya Balan Saree looks is what women can rely on. 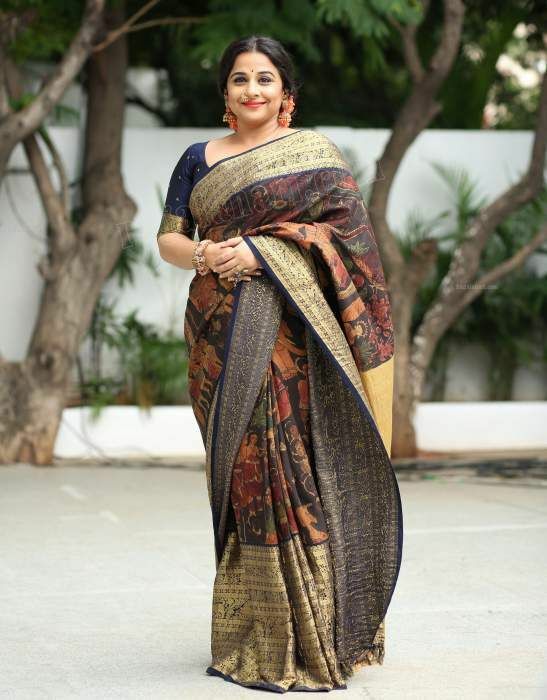 From her lovely choices of Black sarees to silk sarees and from choosing statement jewellery to compliment her plus size figure and saree is just what makes a her a style expert in sari for plus size women. 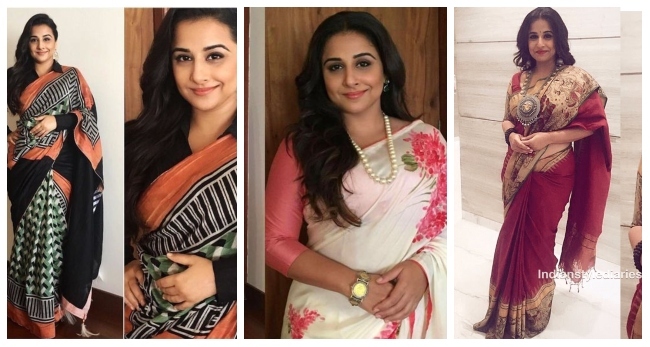 We have put together some of the Best Saree Styles from Vidya Balan from her starting days to currently being a diva in plus size figure is just stylish enough for me being able to write up this post. Some are sarees from the time when she was one of the first actresses to love Sabyasachi Sarees in Black, white, gold and red combinations. 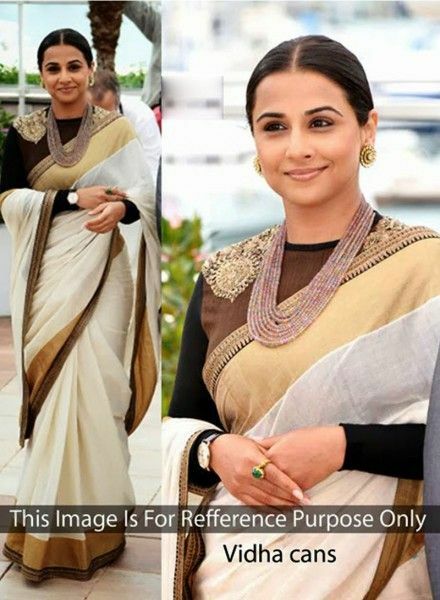 She was always seen in dressing Sabyasachi sarees and made them popular for their minimal antique gold work borders and silk and net sarees. 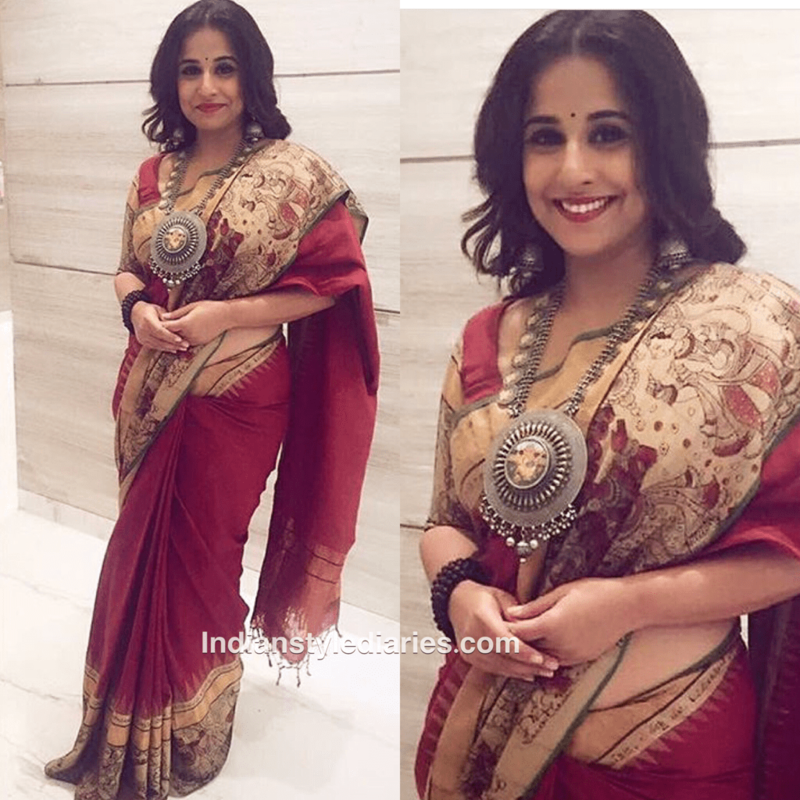 Vidya also chose to Dress for Cannes Film festivals in sari, wore a couple different sarees by Sabyasachi at Cannes Film Festival. 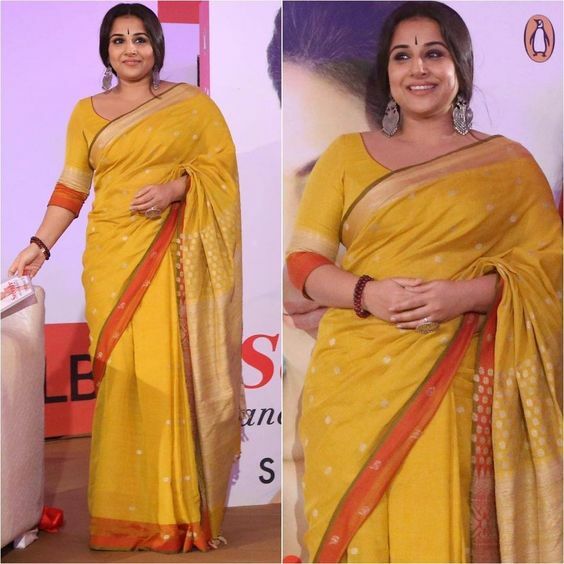 She wore sarees at all her promos and events or festival parties. 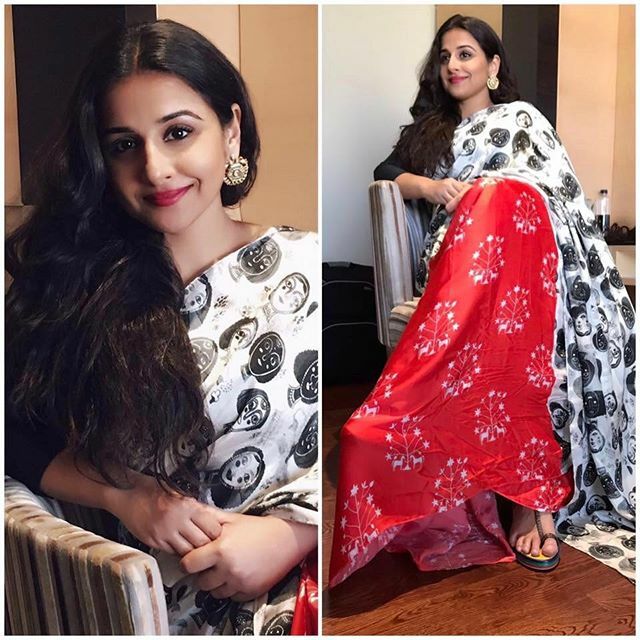 She dresses her Best saree looks at her wedding and also chose sari looks in films as her costume giving us top saree trends from movies like Kahaani 2, Tumhari Sulu and Humari Adhuri Kahani Saree looks were a trend well set by Vidya. 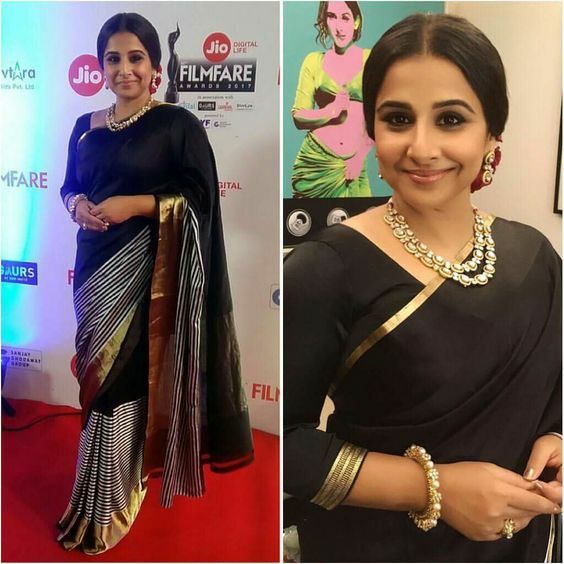 She Just Loved to Wear all her Black Sarees, from Sabyasachi Saree to Ayush Kejriwal. 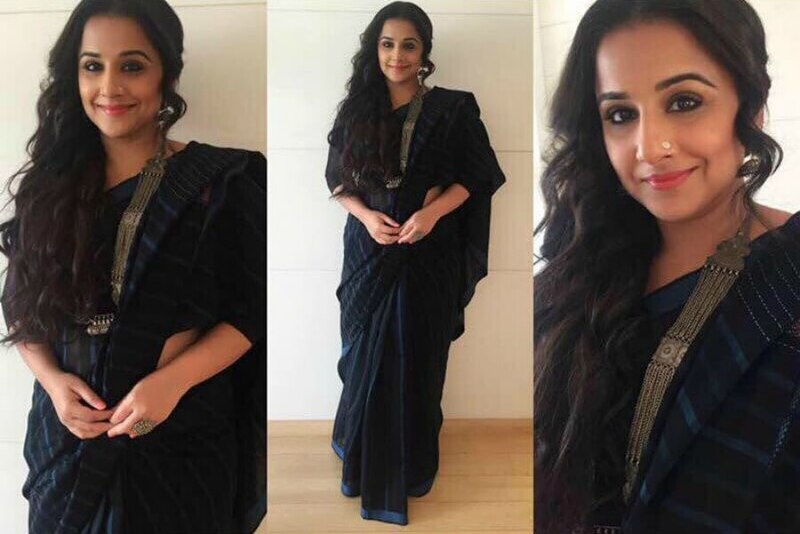 We chose some of Vidya’s Top Black saree looks to add to this list here. We saw her dress in stunning printed sarees like Kalamkari sarees, the Geometric Printed Sarees to Striped or floral Vintage sarees and saree blouses. 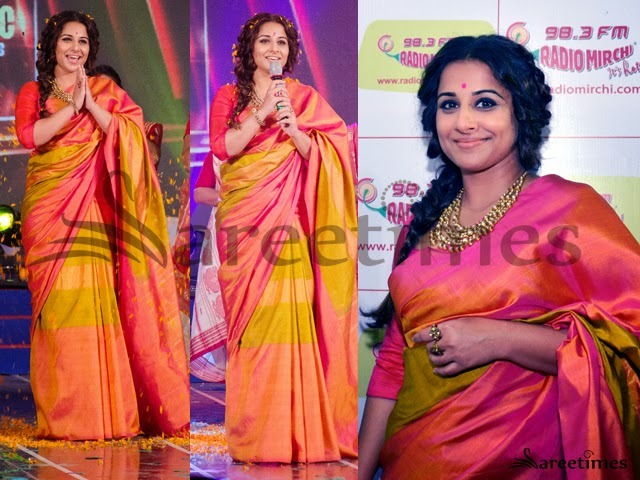 Yes, she is a perfect diva for Silk Saree Inspiration for all women. 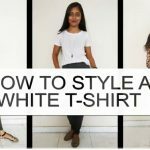 Plus size women can take lots of tips from her silk saree looks, she chooses, soft silks, she chooses, solid colors and minimal color blocking panels and also sari blouses which would match well. 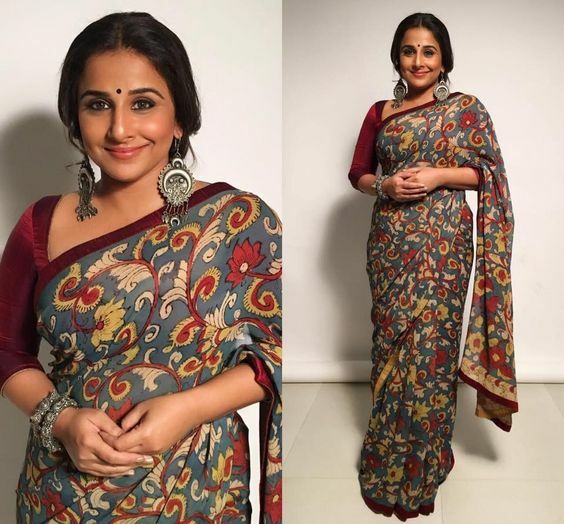 See below to see all her Best Sabyasachi Saree Looks. 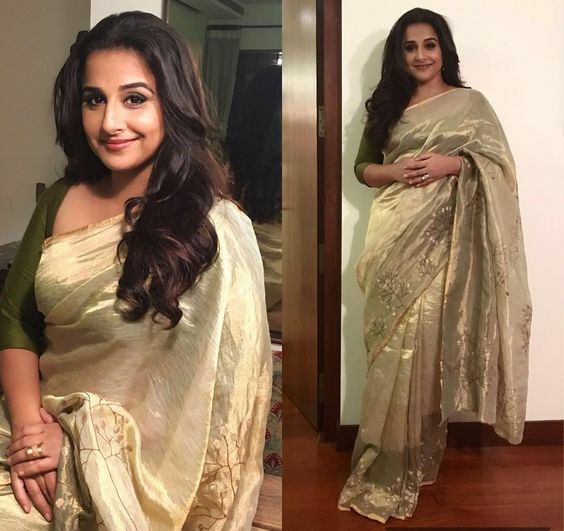 Like I mentioned in the top of this post, she has been a great muse of Sabyasachi designer sarees from the very beginning making people know his sober elegant saree line in colors like white, black, red and gold combinations. 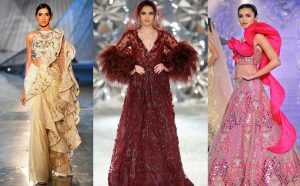 She is always seen in designer sabysasachi saree and these are her top saree looks from the designer’s collection. 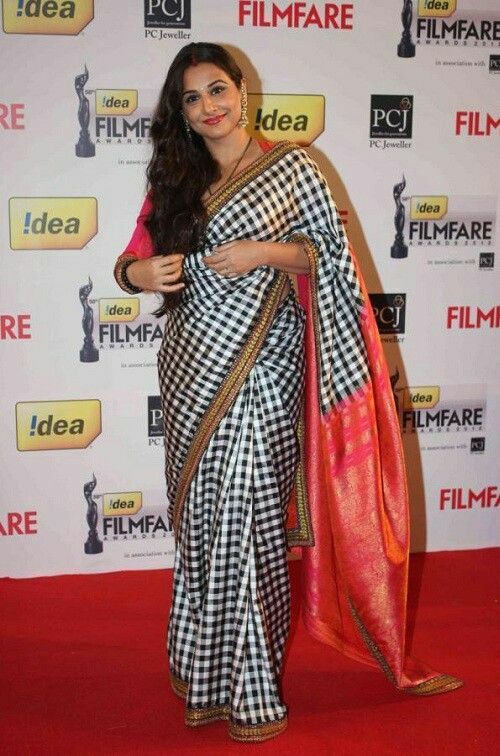 Vidya Balan saree in Gold by Sabyasachi with his Black Kalkati Work Border. 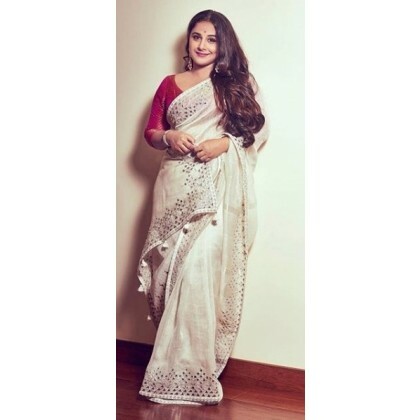 We have seen Vidya choosing her party sarees to be elegant with minimal detail or solid sober sarees with one tone embroidery or embellishments. 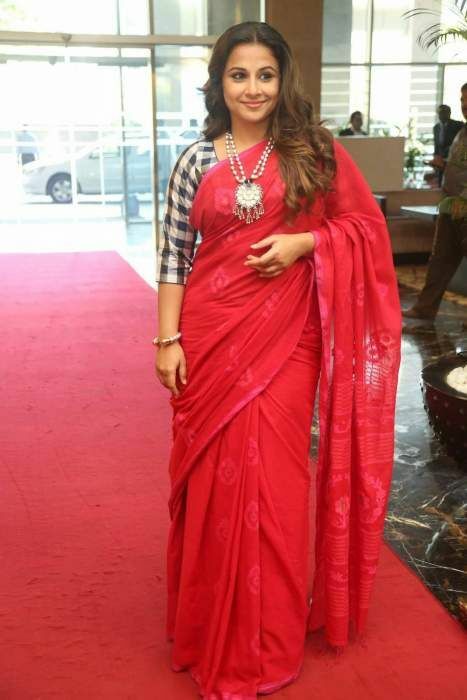 She was seen wearing party wear saree in on color with same color embroidery in movie Hamari Adhuri Kahani also setting a saree trend of this kinds of sarees. 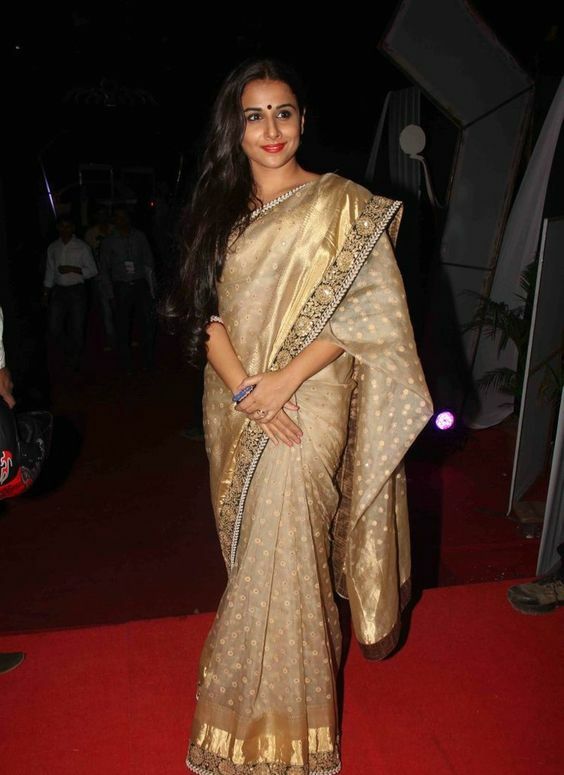 Vidya Balan Raw Silk Beige Saree. 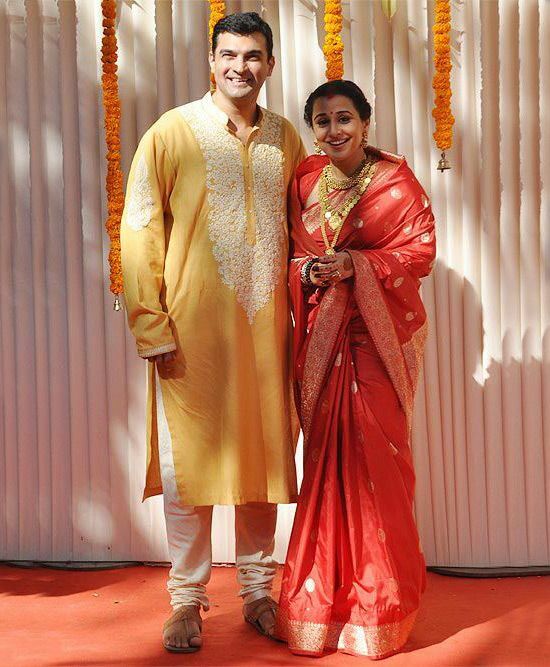 She has also worn beautiful colors of cotton saree which are of lighter in weight and look too. 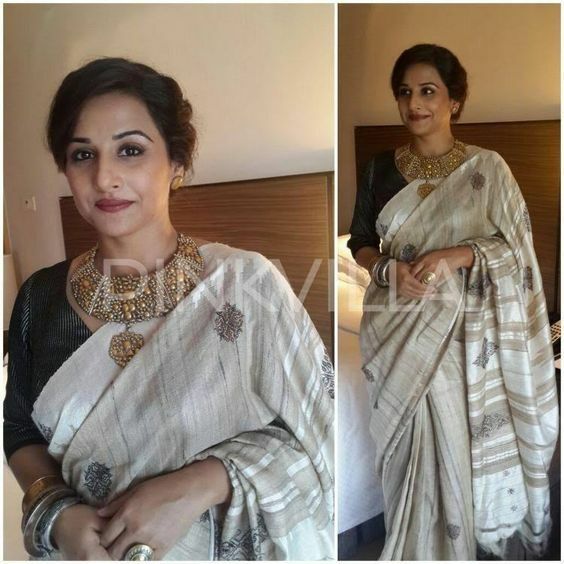 During her promotions of movies or attending some events. 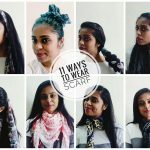 Some saree styles from Masaba and color blocking sarees to single tone cotton sarees.